I had already seen her at sea. Last time she was regattering in the "Vele d'Epoca" (vintage yachts) of Imperia, but even while she lulls unrigged in the waters of the Valdettaro a Le Grazie shipyard, Candida seems beautiful to me. The Captain Claudio Mottola greets me with a smile as he descends the gang plank and then introduces me to his crew working in various points of the boat. We then settle down to a chat on deck. Captain, where did your love for the sea and sailing boats begin to grow? In Trieste where I attended the Adriaco Yacht Club. I was 10 years old when I started sailing flat keels: Cadets, Flying- Juniors, 470s. I later went to the Leghorn Naval Academy and trained in the SVMM, regattering FDs and IOR class boats. I have regattered on board the Stella Polare and participated in the North American Campaign, the OP Sail '76,on board the Amerigo Vespucci as a cadet. 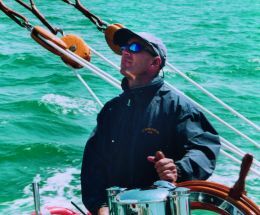 I fondly remember my first two Atlantic crossings as Mains Topman, the Bermuda-Newport regatta, and then New York, Boston, Halifax, the Azores and the return trip to the Mediterranean for the Bi-centenary of the foundation of the United States. The Academy over, I was detailed to war ships as an officer: the San Giorgio, the Perseo, the De Cristoforo and the Battle-Cruiser Vittorio Veneto for a total of 10 years. Did you seek an appointment back onto sailing boats or was this pure chance? In fact I left because deep down I heard a call to return to sailing boats as a skipper. I began doing Oceanic crossings and regattas on all sorts of sailing boats ranging from ocean-going catamarans to vintage schooners; since then I have never abandoned the yachting world. At a later stage, and having in the meantime married, I approached leisure sailing to be nearer my family. I was always enthralled by the idea of being commissioned to one of these splendid sailing vessels such as Candida which a fortunate few yacht owners possess. I recall that the powerful "J" class yachts, the true thoroughbreds of the sea, were part of my childhood dreams; it was therefore a great satisfaction for me to regatta on board Candida at Imperia. She represents one of the last Big Boats, built for British circles where yesteryear owners challenged one another, rich landowners and entrepreneurs near the king and his court, for whom sailing challenges were almost a social sport. What difficulties arise during a regatta, sailing these almost swan like boats which near and pull away at great speeds all wings to wind? Managing the equipment is certainly a complex matter. The 48 metre mast in douglas wood is quite fragile. Because of the running stays, a poor manoeuvre or a simple delay are enough to dismast; it should suffice to think that the boom ways 1300 Kg, the mainsail 650 Kg, the mast 6300 and that the sail area is of 650 sqm, to appreciate the formidable stress loads the rigging undergoes. My state of alert and caution levels are always very high, especially whilst regattering. In times gone by one instead always tried to find the boat's ultimate limit. Herman Andreae, Candida's first owner, was also the first owner to take the helm during a regatta, thereby braking a tradition which saw rich English owners of the time, keeping well away from manoeuvres. Andreae's example was quickly taken up by the new owners' generation who soon got directly involved in cruising and regattas. Judging from your words and the concern for the boat's safety which can be gleaned by them Captain, I can see that speaking about you or Candida are one of the same thing. How many of you run the boat? To be her Captain is certainly one of life's dreams come true. Under normal circumstances it is six of us running the boat and I can assure you it is a very demanding job. 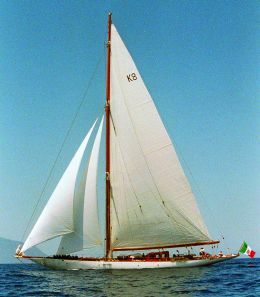 On the occasion of the "Vele d'Epoca" of 2004, Candida started to regatta again after 12 years and arrived second to Cambria. I had a crew of 20 on that occasion. What does the owner do with Candida when not regattering? He sails about for one or more days and never for very long cruises. Owners like to reach nice places and drop the hook in some charming bay. What they like most is to relax and be taken where the wind takes us and then, after a pleasant swim, settle down to a tasty lunch prepared by our expert neapolitan cook. Do the crew men have specific tasks to perform on board? No, my seamen can do all sorts of things. During the winter as you can see, we're at the shipyard for maintenance work particularly to the woodwork, hull, mast and boom. Furthermore the mechanics and general equipment are overhauled. In this instance, the coxswain's role is fundamental as he knows the boat thoroughly and will coordinate the maintenance work which from beginning to the last coat of paint, will last for about 5 months. What do you think about the technological novelties in the yachting world? Obviously from the GPS onwards a lot of problems have been solved. At the same time the art of course plotting without modern instruments, common to skippers of times gone by, has been lost and with it, the taste of the voyage, the experience of solitude and the entente between the boat and the natural elements. How would you advise a youngster with a passion for the sea wishing to work in this field? I would advise him to approach the world of Superyachts as these vessels offer career possibilities, interesting encounters and magnificent voyages. The other side of the coin is the difficulty to maintain meaningful lasting relationships on land. If one were to work on leisure yachts, it would be important to stay in close contact with one's family during the maintenance period. Other work possibilities can be offered by boat transfers, regattas, by services and charters. Possibilities are not amiss for those with good will. THE CAPTAIN'S OF J CLASS "CANDIDA"
Present comand: J class "Candida"
of Lion when "Parsifal" sank and I lost a number of friends: I was skippering "Gaya" in the Transat des Alizéé. Your fondest memory during your Captainship: arriving on board Freya at Capo Verde Islands under full sail in strong wind conditions and the close encounter with a family of whales in mid Atlantic on board the Catamaran IsisB. How do you see your role as Captain and the world of yachting you operate in: It is a wonderful profession and one works seriously and honestly, with great respect for the boat, the crew and of course the owner.